May | 2014 | Niblick's Signs of Intelligent Life–or Not! Last week, The Fetching Mrs. Wall and I went to see the vintage WWII aircraft on display at the Lyon Air Museum, near John Wayne Airport. We had heard the planes flying overhead through the weekend, so we went to see them up close. Laurie’s dad was a B-26 pilot (“Marauder”) during that war and was awarded the DFC (Distinguished Flying Cross), so she wanted to see “Dad’s plane.” A slightly unnerving side note: The Marauder also had another, less attractive nickname: “The Widowmaker,” as it was one of that era’s most difficult aircraft to fly, and crashed all too frequently. While at the museum, I had the honor of meeting (Ret.) Lt.Col. Robert Friend, a member of the Tuskeegee Airmen. Bob was signing autographs, mingling and talking with the museum’s visitors, and he had quite the line waiting to speak with him. Because I had something specific to discuss with Bob, I patiently waited in line for my turn. While chatting with Bob, we discovered we had a mutual friend: Col. Hannibal M. Cox, Jr., who was also a Tuskeegee Airman. 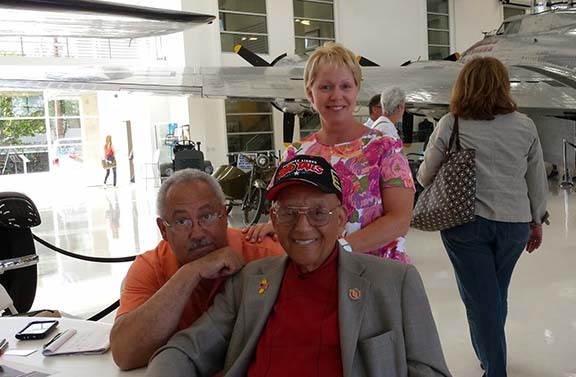 Hannibal was a dear friend and mentor during my days at Eastern Airlines, and to have made this linkage with Bob Friend, made the visit to Lyon Air Museum all the more special! Alas, we lost Hannibal in 1988, and with him, went another of our cherished “red tails.” I’m just glad that Bob is not only still among us, but that he also lives in Orange County; which means I’ll get to see him again. Editor’s note: After publishing this story, I was reminded by another Eastern Airlines colleague that we had yet another of the storied Tuskeegee Airmen in our midst: Jim Plinton. Jim was an Eastern VP and while a member of the “Airmen,” helped to train pilots! Two extraordinary men at an extraordinary time in US aviation!